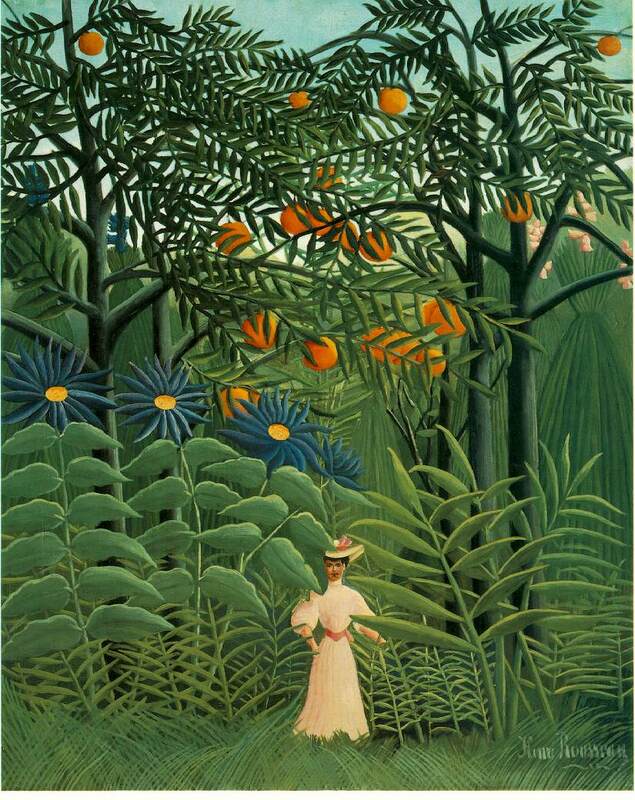 Rousseau, Henri, known as Le Douanier Rousseau (1844-1910). French painter, the most celebrated of naОve artists. His nickname refers to the job he held with the Paris Customs Office (1871-93), although he never actually rose to the rank of `Douanier' (Customs Officer). Before this he had served in the army, and he later claimed to have seen service in Mexico, but this story seems to be a product of his imagination. He took up painting as a hobby and accepted early retirement in 1893 so he could devote himself to art. His character was extraordinarily ingenuous and he suffered much ridicule (although he sometimes interpreted sarcastic remarks literally and took them as praise) as well as enduring great poverty. However, his faith in his own abilities never wavered. He tried to paint in the academic manner of such traditionalist artists as Bouguereau and GИrТme, but it was the innocence and charm of his work that won him the admiration of the avant-garde: in 1908 Picasso gave a banquet, half serious half burlesque, in his honor. 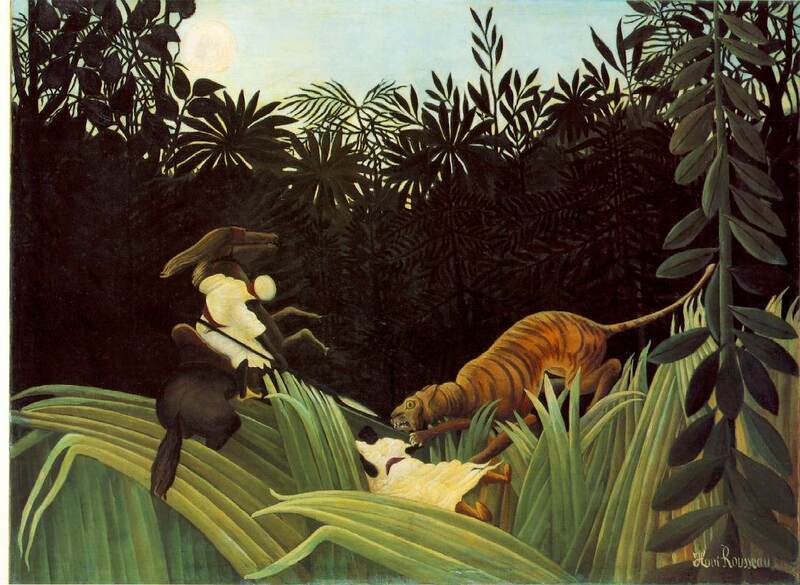 Rousseau is now best known for his jungle scenes, the first of which is Surprised! (Tropical Storm with a Tiger) (National Gallery, London, 1891) and the last The Dream (MOMA, New York, 1910). These two paintings are works of great imaginative power, in which he showed his extraordinary ability to retain the utter freshness of his vision even when working on a large scale and with loving attention to detail. He claimed such scenes were inspired by his experiences in Mexico, but in fact his sources were illustrated books and visits to the zoo and botanical gardens in Paris. His other work ranges from the jaunty humor of The Football Players (Philadelphia Museum of Art, 1908) to the mesmeric, eerie beauty of The Sleeping Gypsy (MOMA, 1897). Rousseau was buried in a pauper's grave, but his greatness began to be widely acknowledged soon after his death. One artist who prefigured the Surrealists' idea of fantasy with his fresh, naОve outlook on the world was the Frenchman, Henri Rousseau (1844-1910). Like Paul Klee, he defies all labels, and although he has been numbered among the NaОves or Primitives (two terms for untrained artists), he transcends this grouping. Known as Le Douanier , after a lifelong job in the Parisian customs office, Rousseau is a perfect example of the kind of artist in whom the Surrealists believed: the untaught genius whose eye could see much further than that of the trained artist. 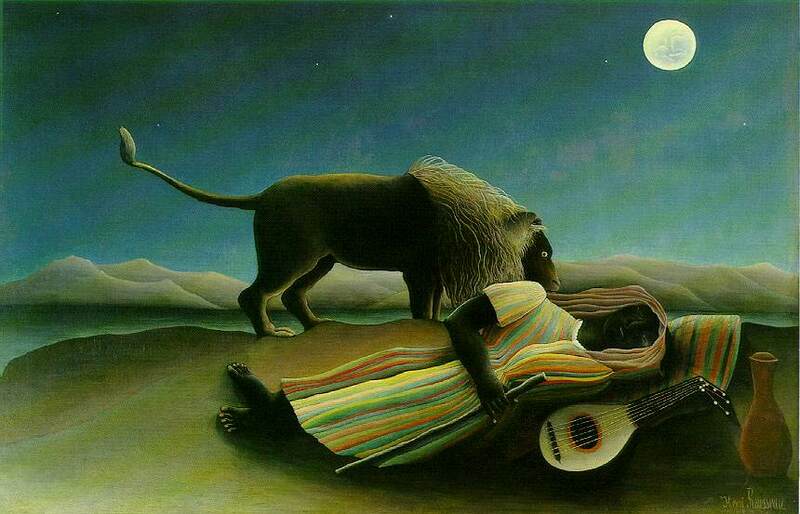 Rousseau was an artist from an earlier era: he died in 1910, long before the Surrealist painters championed his art. 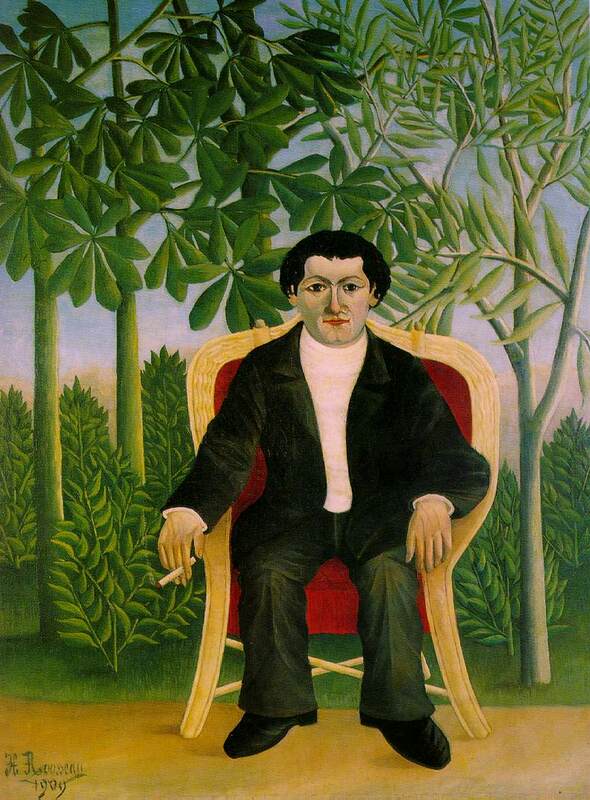 Pablo Picasso, half-ironically, brought Rousseau to the attention of the art world with a dinner in his honor in 1908: an attention to which Rousseau thought himself fully entitled. Although Rousseau's greatest wish was to paint in an academic style, and he believed that the pictures he painted were absolutely real and convincing, the art world loved his intense stylization, direct vision, and fantastical images. 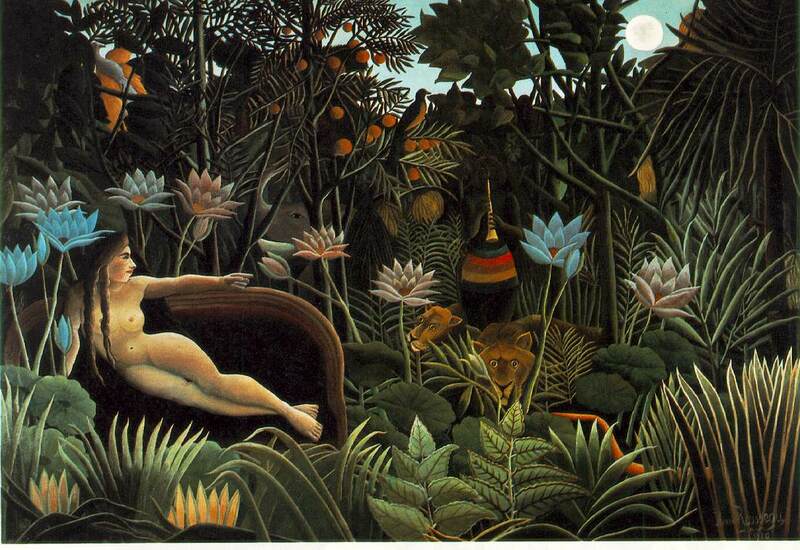 Such total confidence in himself as an artist enabled Rousseau to take ordinary book and catalogue illustrations and turn each one into a piece of genuine art: his jungle paintings, for instance, were not the product of any first-hand experience and his major source for the exotic plant life that filled these strange canvases was actually the tropical plant house in Paris. 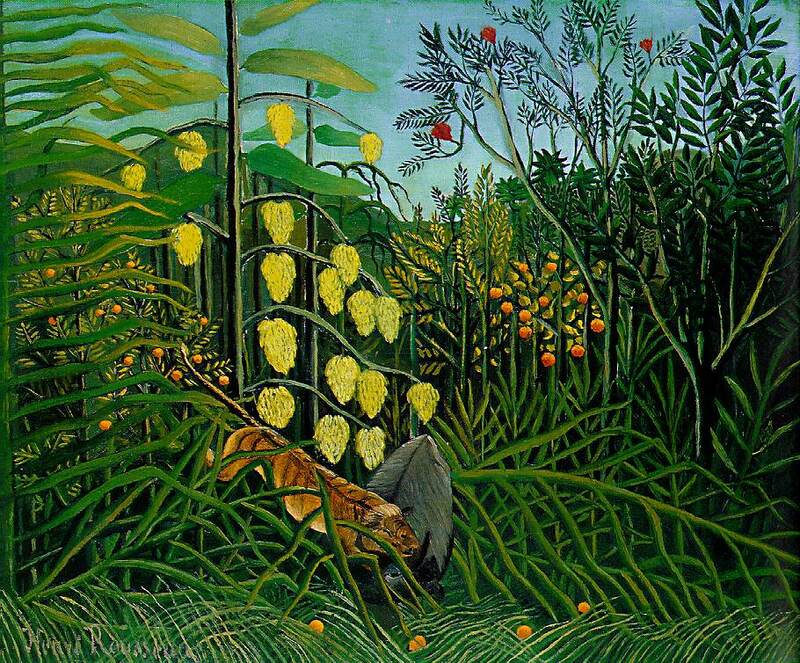 Despite some glaring disproportions, exaggerations, and banalities, Rousseau's paintings have a mysterious poetry. Boy on the Rocks (1995-97; 55 x 46 cm (21 3/4 x 18 in)) is both funny and alarming. The rocks seem to be like a series of mountain peaks and the child effortlessly dwarves them. His wonderfully stripy garments, his peculiar mask of a face, the uncertainty as to whether he is seated on the peaks or standing above them, all comes across with a sort of dreamlike force. Only a child can so bestride the world with such ease, and only a childlike artist with a simple, naОve vision can understand this elevation and make us see it as dauntingly true.